After two and a half years of design and coordination, our production team has finally brought one of our favorite projects to life! Brenda Glavin, BIM & Production Manager, Brandon Douglas, Senior Drafter, and Michael Bellender, Drafter, showed off their 3D designs at last week’s BIM Day in downtown Denver. 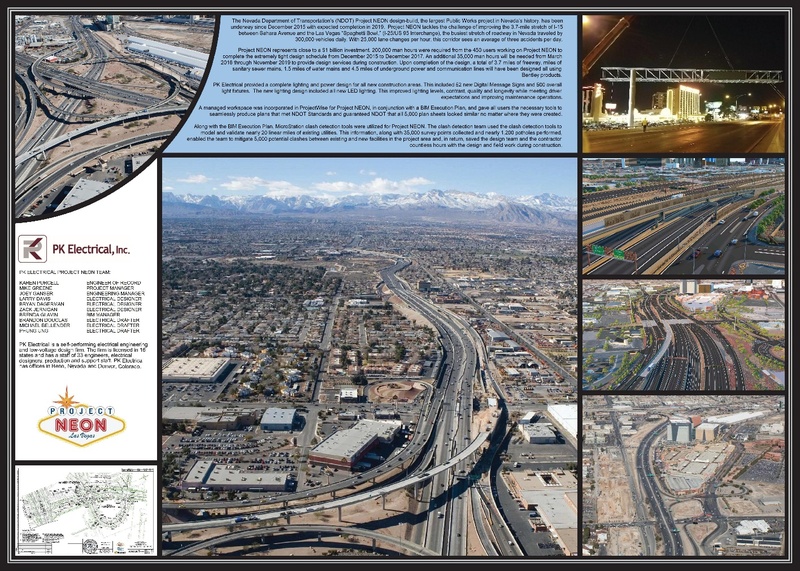 Other planned upgrades include reconstructing the Charleston Boulevard interchange, extending Grand Central Parkway over the Union Pacific Railroad tracks as well as connecting to Industrial Road for improved downtown Las Vegas access and mobility. There will also be aesthetic and landscape upgrades, intelligent messaging signs and improved drainage. Estimated construction cost is $560 million. Single platform – less time spent cross referencing and awaiting approval leads to increased productivity and quality of work. As a result, the overall project construction time and costs are reduced. Reduces errors – any updates or changes are instantly reflected throughout the model, therefore reducing human error in the design and construction phases. A 3D model also provides an all angle view of the building and elevation, which helps to identify and rectify errors before they occur. Multidiscipline design process – BIM data is centrally stored, allowing coordination between engineers, architects, designers, and project managers across all disciplines. Additionally, we are able to collaborate easily between our office locations, as all team members have accessible the most current, consistent, and relevant information at all times. Client satisfaction – BIM is a resource that not only increases our confidence in all aspects of the design process, but leaves our clients extremely satisfied with our work. The overall quality, consistency, and increased efficiency of the project life cycle benefits our clients, as well as the final product. BIM Day is an annual event hosted by the Denver International Airport and held at the Webb Municipal Building in Denver. Production personnel from a variety of industries converge to share project experiences, new technologies, strategies, and lessons learned. If you are looking for Reno electrical engineering firms, electrical engineering firms in California, a Nevada professional engineer, Colorado engineering firms, engineering firms in Denver CO or just a top electrical engineering company for your project, contact us directly or stop by the Reno or Denver PK Electrical offices.